Add your credit card, change billing address, cancel your subscription or learn how to pay by invoice. Your organization can have only one owner. The owner is the only person who can see and change billing details, add new credit card or delete the entire organization. You can transfer ownership to someone else, meaning you'll no longer be able to do all the stuff mentioned before. 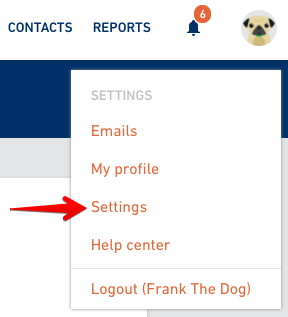 Go to your profile and select Settings. 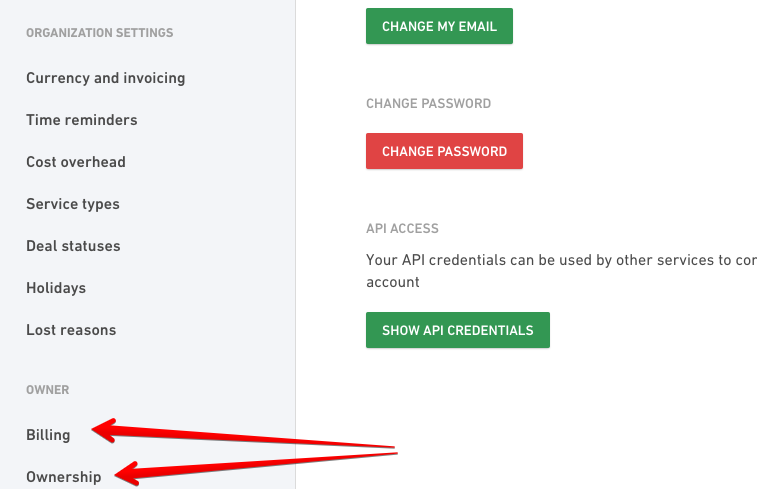 If you're an owner, you'll have access to the Ownership and Billing part of the settings no one else but you can access. 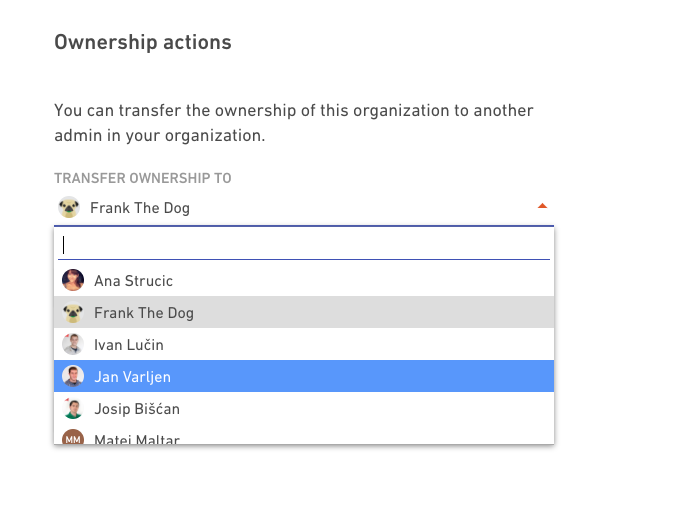 To transfer ownership to another person from your organization, click on the Ownership from the menu and select someone from the dropdown menu. 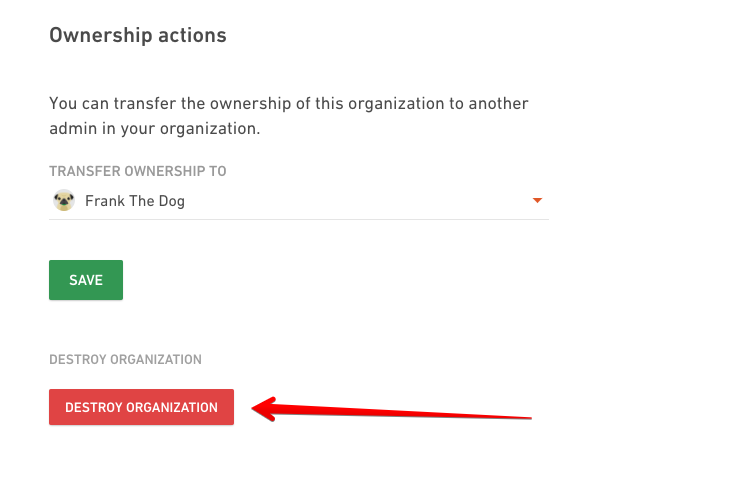 If you want to completely delete the entire organization, click on the Destroy button. This action will delete everything from Productive, including everybody's accounts in the organization. No one will be able to login or access the data once the organization is destroyed. To see your subscription plan, go to the Settings and select Billing from the menu. This is where you can see how many users you have and how much you're spending monthly or yearly. We charge for two types of users: employees and contractors. Inviting clients in Productive doesn't change your pricing plan. 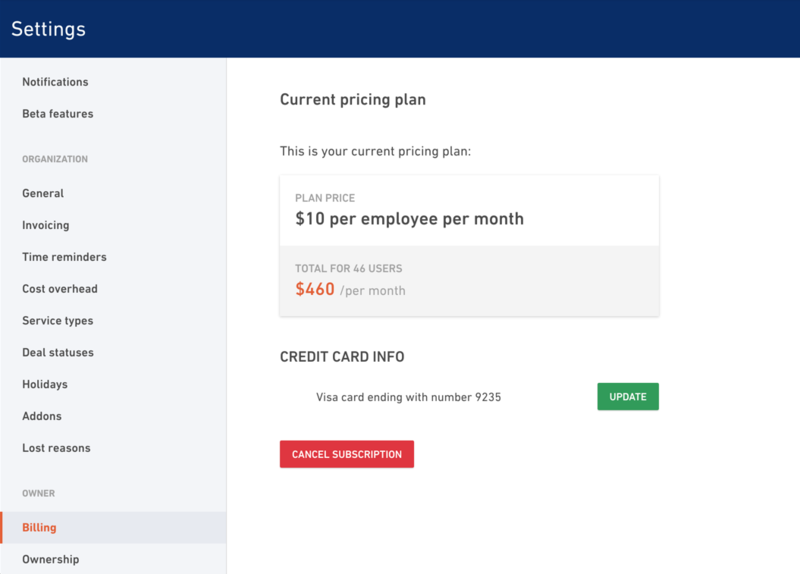 Every new user (employee or contractor) you invite to Productive automatically adds up to your subscription plan. If you want to add a credit card or change the existing one, click the Update button. 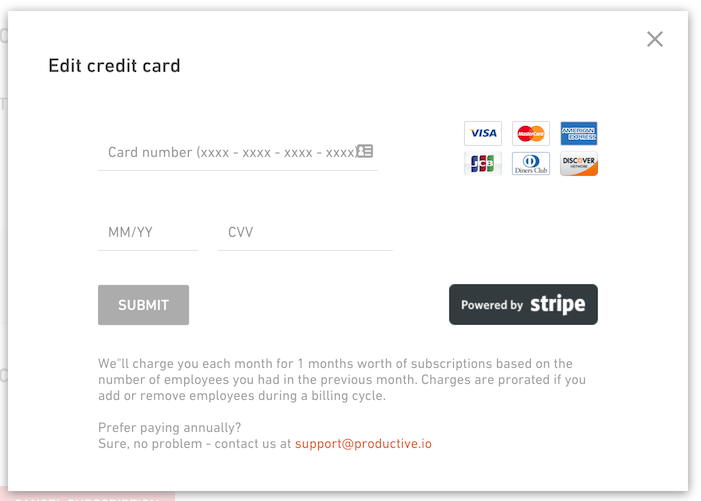 We use Stripe, one of the largest payment processing companies in the world. Card information storage, transmission and processing is completely PCI-Compliant. Every transaction is processed with the same high level secure encryption just as it is in a bank. We don’t store your credit info nor do your credit card numbers pass through our servers at any time. You can also change your billing info here. This is the info that will be show on your Productive invoice. The billing email is the email where you will receive your invoice. When first buying Productive subscriptions, you can buy any number of seats you want (as long as it is higher than 10) and we will invoice you accordingly. For example, if you decide to buy 16 user subscriptions, we will invoice you for $2304.00 which covers the yearly cost for 16 user seats. However, if you decide to add, e.g. 3 user seats to your account the following month, you will need to buy a package of 10 annual user subscriptions, which is the minimum that needs to be met for invoice payment. Estimate the growth of your company within the current yearDepending on the expected number of additional people you will hire within your Productive subscription year, you should consider getting a higher number of Productive user seats in advance to accommodate your growth. Pay by credit cardThis payment method is much more flexible as it allows you to add and remove users from your subscription at will, without limits or minimum user seat conditions.